I have two manicures to share with you today and there will be another post tonight. To start, I thought it would be nice to paint my poor cindy hand again. It still weirds me out that my nails are so short and I haven’t been taking care of them enough so they are going to stay that way for a little longer at least. (Plus it’s so easy to swipe on my phone right now…) Oh, well. It’s good to paint shorter nails. It certainly gets done faster! And I love this look enough that I’m top-coating it will gel polish and leaving it on for a week at least. 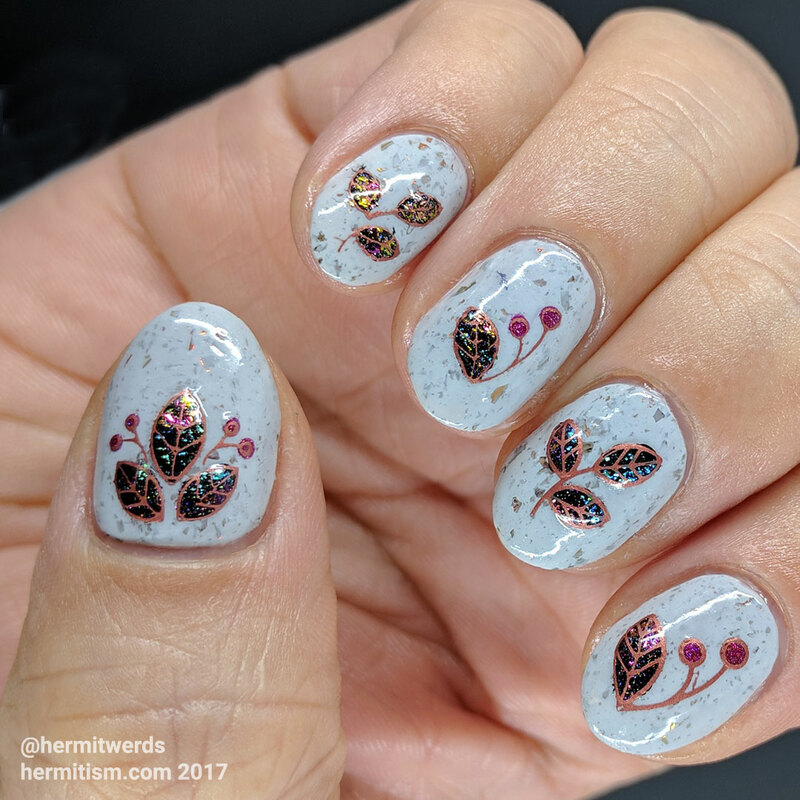 My inspiration was Autumn because I needed to paint at least two autumn-related manicures this month for The Nail Challenge Collaborative. 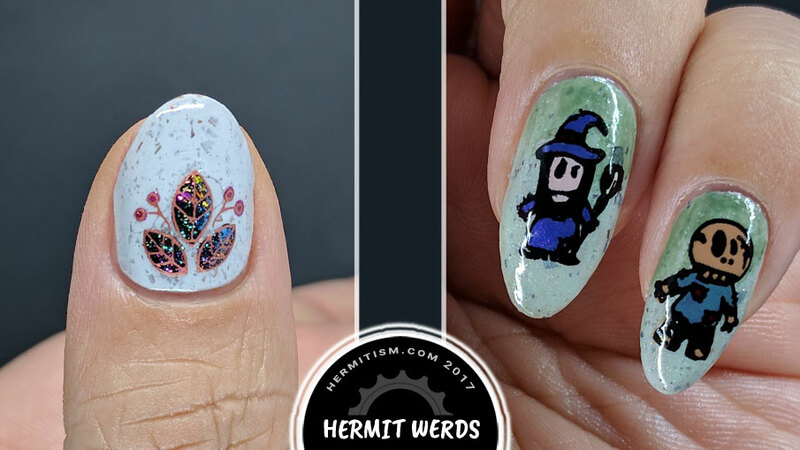 Some ladies chose to include their Halloween nail art, I didn’t want to. I started with Ms. Sparkle’s “Grool!” It’s a light grey crelly with flakies that flash orange, gold, yellow, red, and occasionally green. The flakies inspired more usage of flakies so I dug out the three flakie ILNP polishes I own and gradient filled in my leaves with them and painted black behind that so they’d pop. I mostly picked the stamping color because it was one of the last Mundo de Unas polishes I haven’t stamped with yet. One more to go! 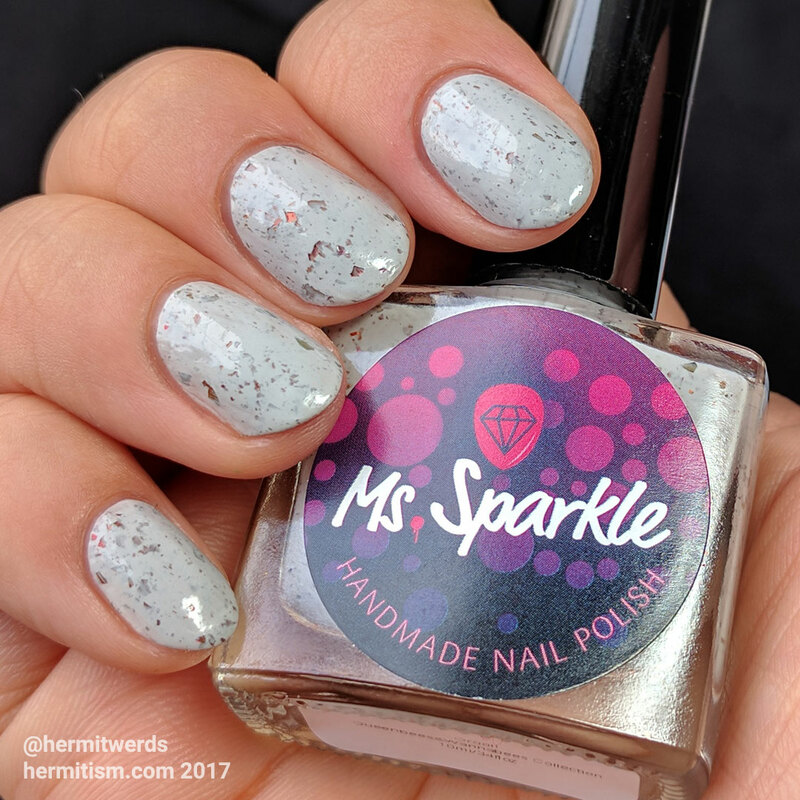 So a quick review of “Grool!” I didn’t get quite as many large flakies on my nails as the swatch photos and I suspect that has to do with when my bottle was poured. I’m not unhappy about it. 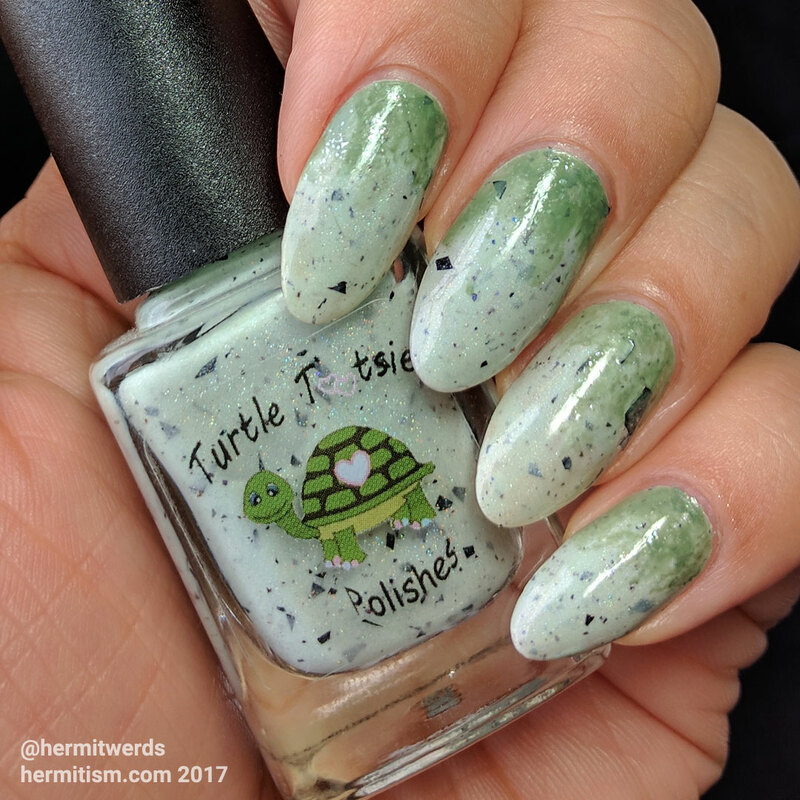 There’s still quite a bit of flakies in my bottle and the slightly less number means it’s less distracting as a background to my stamping (which is good because I don’t tend to paint my nails straight colors). And since I have the three ILNP polishes listed above, I can always add a few more flakies and change the overall tone of the colors flashing back. So in the end it’s more versatile for me and has good coverage. Two to three coats depending on how you flail, self-leveled fairly decently and made no attempt to flood my cuticles. Float your brush as much as you can; that’s why I had to do three on a few nails. There are currently two bottles left at her etsy store. My second nail art is more Halloween-focused for the obvious Halloween prompts from #Clairestelle8Challenge and #FireDazedChallenge. Ever since I bought this DXE04 stamping plate that basically has some of the most classic Halloween costumes out there I wanted to do nail art just using this plate. So I decided that would be my last Hurrah! 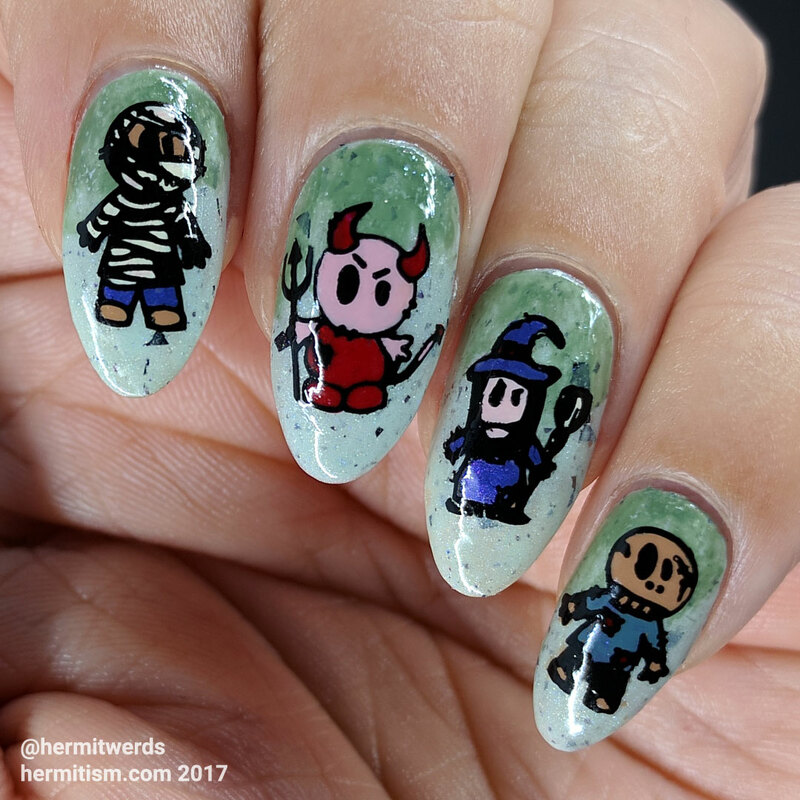 for Halloween this year (but not my last morbid nail art for the year, heh). So I picked four of the images, looked at the nail art I had been doing lately, decided I’d been leaning on reds and purples too heavily, and went with a green background. Your glittery autumn leaves are so pretty! And your Halloween characters are very cute – especially the feisty devil.